On Wednesday 3rd April 2019, at 7PM, AlbumArte will host the last of five appointments of the new series of film screenings and artist videos AlbumArte | VideoArtForum, held at AlbumArte’s exhibition space in Via Flaminia 122, Rome. 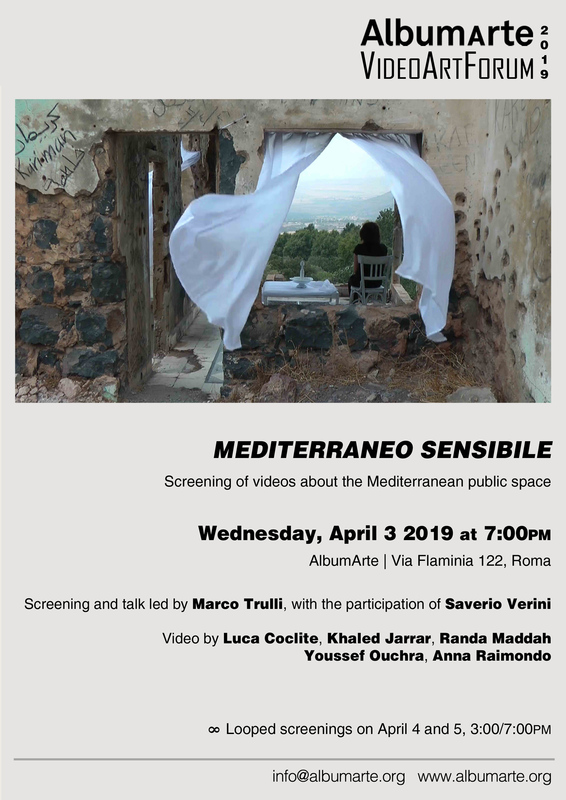 In this occasion, curator Marco Trilli will present a video selection by of artists Luca Coclite, Khaled Jarrar, Randa Maddah, Youssef Ouchra, Anna Raimondo. The screening will be followed by an open conversation with the audience, and with the participation of curator Saverio Verini. All the videos will play again on loop on April 4th and 5th, from 3pm to 7pm. Mediterraneo sensibile is a screening on the various forms of art practices centered around the Mediterranean public space, which in recent years has been the subject of a series of exhibitions, workshops and residencies curated by Marco Trulli, realized within the project La ville ouverte and promoted by ARCI Nazionale in the context of the BJCEM network – Biennial of Young Artists from Europe and the Mediterranean. Given the recent publication of the volume La ville ouverte. Politiche e poetiche dello spazio pubblico mediterraneo (Viaindustriae publishing, 2018) which summarizes the work of observation, research and production of the project, the event at AlbumArte will feature a selection of videos by artists who are active in the Mediterranean territory, with a particular attention to those works focused on the delicate interweaving of poetry and politics. Since 2016, AlbumArte | VideoArtForum – directed by Cristina Cobianchi and coordinated by Valentina Fiore – presented Italian and international artists and curators both from Italy and aborad. The project confirms the ongoing interest of AlbumArte in the field of video art, an expressive medium with which the association has been involved ever since it was founded in 2011, thanks to a series of initiatives of screening and video art exhibitions both in Italy and abroad, defining its investigation of this particular area of artistic creation as one of the most significant. Marco Trulli (b. 1980, Anzio – IT) is a curator and a cultural worker. He graduated from the Faculty of Conservation and Cultural Heritage of the Tuscia University in Viterbo with a bachelor’s degree in History of Contemporary Art. Since 2005 he has supervised the public art project Cantieri d’Arte in collaboration with the Tuscia University hosting a number of national and international artists who have created site specific projects and installations for the urban space. In 2013 he was one of the curators of Errors Allowed – Mediterranea 16. Young Artists Biennal that took place at the Mole Vanvitelliana in Ancona. He coordinates the traveling platform La ville ouverte which questions the connection between artistic practices and social and urban contexts in the Euro-Mediterranean area. He also curated the following international projects for BJCEM: Disorder (Nottingham, 2012); La sovversione del sensibile (Milano, 2014); Here is elsewhere (Milano, 2015); Mediterranean landscapes (Italia, Slovenia, Albania 2017). He works as cultural project coordinator at Arci Viterbo and he is the art advisor of the sculpture garden La Serpara. He curated several publications about the connection between art and nature and on the role of art in public space. He is the president of Arci Lazio and is the responsible for Arci nazionale for Innovative projects and spaces, urban regeneration and suburbs. He lives and works between Viterbo and Rome. Saverio Verini was born in Città di Castello, Italy, in 1985. Graduated in Contemporary Art History at the Sapienza University, in 2011-2012 he is in the staff of the MACRO Museum of Rome. From 2013 to 2015 he is assistant curator at the Ermanno Casoli Foundation and from 2017 he is the exhibition coordinator at the Fondazione Memmo, in Rome. He has collaborated with cultural institutions such as: Academy of France in Rome – Villa Medici, Polish Institute of Rome, Center for Contemporary Art Luigi Pecci, American Academy in Rome, FOTOGRAFIA – International Festival of Rome, Pastificio Cerere Foundation, Civitella Ranieri Foundation, Granpalazzo art fair, Kilowatt Festival. He is one of the founders of the curators’ collective Sguardo Contemporaneo, with which he has organized several cultural events characterized by a strong participatory attitude. Among the most recent projects: Stop and Go. The art of animated GIFs, Una sola moltitudine (with Filippo Berta and Calixto Ramírez) and White Paper (with Namsal Siedlecki), all conceived for smART gallery in Rome; the exhibition Alberto Burri. Le dimensioni della materia; the project Straperetana, in the hamlet of Pereto (Abruzzo), conceived in cooperation with Monitor Gallery; Unending Incipt, solo show of Paolo Icaro at the Pinacoteca Comunale of Città di Castello (Umbria). He collaborates with the magazine Artribune and regularly writes critical texts for personal and collective exhibitions in museums, private galleries and other spaces. He is the author of the monography Roberto Fassone. Quasi tutti I racconti (2018), published by PostmediaBooks. Luca Coclite (1981, Gagliano del Capo, LE, IT). His artistic research focuses on the analysis of the contemporary image with its connections to landscape and architecture, and the investigation of the correlative sociological influences. For several years he has been watching the transformation of the territory, its surrounding landscape and with that the intrinsic contradictions of the political and social perspectives. He has been involved since many years in many artistic projects, national and international, both as an artist and as a curator, such as Ramdom, Casa a Mare and Studioconcreto. Currently working for Spazio Labo, Bologna. Khaled Jarrar was born in the occupied West Bank in 1976. He researches the potential fallout of the proposed U.S.-Mexico border wall. Jarrar is also working on a film and multimedia series that documents his month-long journey with a group of migrants who traveled to Europe last year in order to draw attention to the plight of Syrian refugees. Jarrar’s solo exhibitions include Ayyam Gallery, Dubai (2016); Art Bartsch & Cie, Geneva (2015); Galerie Polaris, Paris (2014, 2012); Gallery One, Ramallah (2014); Ayyam Gallery London (2013); and Galerie Guy Bartschi, Geneva (2013). Jarrar is a recipient of the 2016 Anni and Heinrich Sussmann Award, which recognizes international artists who are committed to the ideals of democracy and antifascism. He lives and works in Tucson, Arizona. Randa Maddah was born in 1983, Majdal Shams, occupied Syrian Golan. After finishing courses in painting and sculpture at Adham Ismail Center, Damascus in 2003, she graduated from Damascus University, the faculty of Fine Arts, department of sculpture, 2005. In 2007, Randa also took etching courses at the Academy of Arts and Design in Jerusalem. Randa is a founding member of Fateh Al Mudarris Center for Arts and Culture, occupied Golan Heights, which founded by young artists. She currently lives in occupied area if the High Golan. Youssef Ouchra was born in 1984 in Casablanca. He combines sound art, graphic design, performance, installation and video. He questions the relationship between man and his environment. Through the exploration of these issues, Youssef Ouchra demonstrates that he is an artist of his time, and incites the viewer to awaken their unconscious. Informatage, 2013, is a video-performance in which the artist denounces the overabundance of information delivered to us and questions this efficiency. Ouchra is also a committed artist; he denounces the reasons behind conflicts in today’s world. He lives and works in Casablanca. Anna Raimondo was born in Naples (IT) in 1981. She completed the MA Sound Arts at the London College of Communication (UAL, London) and is running a practice based PHD between Arba (École des Beaux Arts) and ULB University in Brussels on urban geography and gender perspective. She has participated in several international exhibitions including: “Seremos serias de la manera más alegre” curated by Florencia Curci at CAso CNB (Buenos Aires, ARG) and “New bounderies of the Wellness of Vagynal Ecosystem” at Ex Elettrofonica Gallery curated by Lucrezia Cippitelli (Rome IT). Her radiophonic works have been broadcast internationally. She has won the Palma Ars Acustica 2016 with her radio work “Me, my English and all the languages of my life” and the price of best soundscape with “La vie en bleu” in the frame of the sound art competition PIARS and has won the prize of the city in the frame of the contemporary art prize Mediatine in 2018. She lives in Brussels (BE) and works internationally.